Last September, when French authorities sent riot police to raze "the Jungle," a makeshift camp near Calais, they made sure plenty of international media were on hand. By closing the camp and dispersing its population of clandestine aliens who were awaiting a chance to sneak across the Channel to Britain, the authorities aimed to provide clear proof of France's determination to battle illegal immigration. But less than three months later  with TV cameras gone  humanitarian workers are struggling to deal with problems that have actually been exacerbated by the raid. On Dec. 9, the aid group Secours Catholique won permission to begin setting up a center to care for the most vulnerable aliens who stayed in Calais after the Sept. 22 operation. The approval didn't come easy. With more than half of the nearly 1,000 refugees who occupied the camp relocated elsewhere, Calais city officials fought efforts by Secours Catholique and other aid groups to set up any services for the remainder for fear that even minimal aid could swell illegals' numbers again. Secours Catholique not only had to win a November court case to overcome the refusal of Calais authorities but also promised that the unit would provide just health, medical and sanitary services to women, children and ailing men among the 300 illegals currently estimated to be in the area  and run it only during the day. "There will be no lodgings in it, and it will be administering to the most vulnerable of refugees," says Philippe Lefilleul, a member of Secours Catholique. "Resistance to any facility was sufficiently high that we're having to limit what we do to minimum humanitarian levels." Lefilleul says a majority of people who had resided in the Jungle have fallen back to nearby towns on the coastline  or have retreated all the way back to camp aside canals in Paris where they wait for smugglers to hide them in U.K.-bound trucks or freight trains. And Calais doesn't want those and newly arrived illegals to join the estimated 300 Jungle inhabitants still in town. The reason is evident: with its proximity to Britain  30 miles, connected by ferries, trucks, cars and passenger and freight trains using the Chunnel  Calais remains a magnet for clandestine aliens and the human traffickers exploiting their desire to reach the U.K. (where obtaining refugee status is easier and brings more in aid payments). Britain has long demanded that Paris take action to prevent migrants from congregating on French shores with the aim of illegally sneaking across the Channel. France took a first step in 2002, when then Interior Minister Nicolas Sarkozy closed down the Red Crossrun refugee shelter in the Sangatte suburb of Calais, which had housed thousands of illegals planning a jump to England. 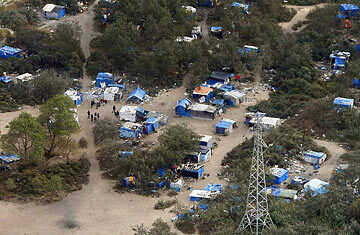 That only sent inhabitants of Sangatte's center flocking to other parts of Calais and its environs. With Sarkozy now President  he has made fighting illegal immigration one of his main priorities  the destruction of the Jungle was designed to send a forceful message that France's humanitarian sympathy had run out. That message seems to have little impact on the people who view Calais as a staging post for a new life, many of whom have fled greater privations and dangers than a newly hostile Calais can offer. Instead, Lefilleul reports, migrants have simply gone underground and into deeper misery, hiding from even the aid groups looking to provide them minimal levels of assistance. "We aren't condoning illegal immigration and aren't naive about the role of traffickers in all this," he says. "But offering a little humanitarian care to such vulnerable people is our duty as fellow human beings and Christians." That's not how Lefilleul's Secours Catholique day center, due to begin operating in January, is viewed across the Channel, where some hostile press reports dubbed it Sangatte II. "This is another gesture of contempt from France to Britain," said U.K. Conservative Party shadow immigration minister Damian Green. "It will encourage more potential illegal immigrants to try to break our law." Natacha Bouchart, conservative mayor of Calais and a backer of Sarkozy's anti-immigration hard line, says her city and others on the coast are "hostage to the British" asylum laws. She says the U.K. should tighten those rather than shift the responsibility on French authorities to keep illegal aliens from making it to Britain. Lefilleul disagrees with both analyses. "The reality is, until we find a way of physically moving the English coast farther away from France, the Calais region will be the place most aliens go because it's closest to the U.K.," he says. "The solution is to find a way to convince illegal aliens not to leave home in the first place. Trying to make their lives as miserable once they're here serves nothing."